The Du-par’s restaurant chain, founded in 1938 at the Los Angeles Farmers Market, has opened its second Las Vegas location, Du-par’s Restaurant & Bakery, at Suncoast Hotel & Casino. Signature items include buttermilk pancakes, made-from-scratch pies, traditional Cobb salad, chicken pot pie, country chicken breast, beef liver, beef stew, gourmet meatloaf and a great hot fudge brownie sundae. Du-par's is open 24 hours a day. Du-par’s Restaurant & Bakery, 9090 Alta Dr., Las Vegas, NV 89145, 702-636-7111, 877-636-7111. After nearly eight years, BLT Burger at The Mirage closed on April 5th and reopened two days later as the resort-operated LVB Burgers and Bar. The new restaurant is helmed by Michael LaPlaca, who is also executive chef at the resort’s Italian restaurant Portofino. LaPlaca brought some fine-dining touches with him, as seen in menu items such as “Diablo’s Huevos” --- deviled eggs with avocado and blue crab meat; mini po’boys stuffed with fried oysters and red pepper remoulade slaw; a “baby wedges” salad with applewood smoked bacon, griddled onion, candied walnuts and buttermilk blue cheese dressing; the “A.A.A.” burger named for its Angus beef, applewood smoked bacon and arugula; and the “P.S.S.” burger, made with grilled pineapple relish and sesame slaw atop a soy-glazed salmon patty. For dessert, there are fried donut holes filled with Nutella ganache and banana toffee sauce. LVB Burgers & Bar is open daily for lunch, dinner and late-night dining. LVB Burgers and Bar, 3400 Las Vegas Blvd. S., Las Vegas, NV 89109, 702-791-7111, 800-627-6667. Sake Rok is now open at The Park, located on the Strip between the Monte Carlo and New York-New York. Open for lunch, dinner and latenight eats, the kitchen is helmed by SushiSamba alum Bobby Silva, whose menu is full of Japanese and Japanese-American fusion dishes and an array of sushi and private-label sake. For entertainment, there are DJs spinning sets, sporadic theatrical vignettes and interactive servers who double as entertainers and invite guests to partake in restaurant-wide sake bombs, dance parties and lip-sync serenades. The décor is inspired by Japan’s pop culture and fashion, with bold accents, Japanese signage hanging from above and walls lined with distressed murals inspired by the underground graffiti scene. Above the main dining room and mezzanine is a private event space dubbed “Sakura Terrace at The Park.” It opens up to a 1,300-square-foot balcony with sweeping views of T-Mobile Arena and the Las Vegas Strip. Sake Rok, The Park, 6 Park Ave., Las Vegas, NV 89109, 702-706-3022. On Cinco de Mayo, Station Casinos and Clique Hospitality opened Borracha Mexican Cantina inside Green Valley Ranch. The restaurant and bar pays homage to the Day of the Dead, with decorative skulls, a hand-painted floor, dark wooden beams and a wraparound graffiti mural by famed Mexican artist Oscar Flores. The kitchen is helmed by Jesus "Chuy" Villegas, and his menu features a diverse collection of shareable plates, such as imaginative burritos and tacos made with handmade tortillas; meats that range from rotisserie chicken and slow-cooked short ribs to fresh Baja fish; and vegan and gluten-free options. Borracha also hosts happy hour from 4 p.m. to 7 p.m., offering items like al pastor carne asada skewers with roasted pineapple salsa and masa or smoked chicken taquitos with pico de gallo and house-made poblano sour cream, all priced at $6. Borracha Mexican Cantina , 2300 Paseo Verde Pkwy., Henderson, NV 89052, 702-617-7777, 866-782-9487. The Still, now open at The Mirage, is located off of the casino in the space formerly home to Revolution Lounge. Considered the ultimate man cave and a haven for sports junkies, the project from Clique Hospitality features 27 televisions tuned to sports programming or sports-themed movies, more than 50 craft beers, walls decorated with beer signs, leather couches and chairs, tap handles built into stills and Bud Bud’s — a refurbished Airstream trailer that serves as a fully functioning kitchen. The menu is fashioned by chef Brian Massie and offers his spin on upscale bar food. Items include crispy-style chicken wings in Buffalo or spicy Korean glaze, beer battered fish and chips, a grilled al pastor chicken quesadilla with manchego cheese and roasted garlic Sriracha butter steak tips. The Still, 3400 Las Vegas Blvd. S., Las Vegas, NV 89109, 702-791-7111, 800-627-6667. Strip House at Planet Hollywood Resort & Casino has launched the all-new Dock-to-Dish sustainable seafood program in partnership with Honolulu Fish Company, which will provide the freshest hand-selected pieces of fish reeled in no more than 16 hours prior to being served. The fish selections are line-caught in a region 375 miles north of Oahu known as the Fracture Zone, an ideal area for fishing. Corporate executive chef Michael Vignola said, “Our Dock-to-Dish nightly specials provide something exquisite for guests to enjoy. The day’s best catch from over 30 varieties are prepared lightly to really showcase the nuances of the fish.” Highlights of the types of fish chef Vignola and his culinary team are using include Monchong, Ono, White Walu, Nairagi, Kajiki and Opah, among others. Strip House, Planet Hollywood Resort & Casino, 3667 Las Vegas Blvd. S., Las Vegas, NV 89109, 702-737-5200. Vegetarians, rejoice! From May 15 to May 21, DB Brasserie at The Venetian will feature The Spring Garden Tasting --- an all-vegetarian tasting menu celebrating the season of renewal and warm weather. Offered for dinner beginning at 5 p.m., the multi-course menu will cost $75 plus tax and tip and include canapés of tomato-mozzarella and basil arancini, sweet and sour eggplant tartine and gougères au comté; spring pea soup with crème fraîche and rosemary; beets baked in seaweed-salt crust with black cardamom, horseradish and chive aioli; wild mushroom vol-au-vent with young root vegetables and asparagus; and wild berries and a pistachio sundae. DB Brasserie, The Venetian, 3355 Las Vegas Blvd. S., Las Vegas, NV 89109, 702-430-1235. Otto Enoteca Pizzeria at The Venetian will celebrate its ninth birthday on April 25, and to commemorate the occasion, the restaurant will offer a few deals throughout its birth month. At lunch, guests might pick from select items on the Antipasti – Verdure (vegetable) menu for $9; for dinner, the best of Otto’s menu is packaged in the Tasting for Two offer, which consists of appetizers, entrées and desserts for two people for $99. In addition, the restaurant will offer its refreshing Venetian Spritz cocktail made with Prosecco, Aperol and soda for $9 a glass. Otto Enoteca Pizzeria, The Venetian, 3355 Las Vegas Blvd. S., Las Vegas, NV 89109, 702-677-3390. 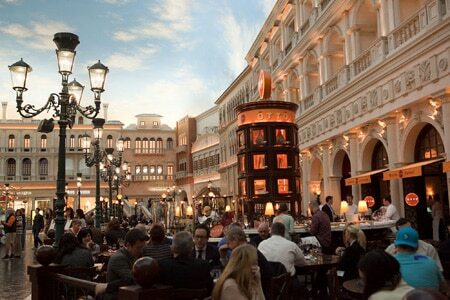 Trevi, located inside The Forum Shops at Caesars Palace, has launched a vegetarian, vegan and gluten-free menu. The vegetarian options include margherita pizza topped with Roma tomatoes, fresh mozzarella and basil; thinly-sliced eggplant crisps served with marinara sauce; and campione di bruschetta, a sampling of chef-inspired relishes and dips with grilled Tuscan bread. Vegan diners might order dishes such as minestrone soup; spaghetti with artichokes, asparagus, tomatoes and green beans topped with toasted garlic, extra virgin olive oil and crushed peppers; or zucchini oreganata with petite white beans, green beans, concassé tomatoes and oregano gastrique. Gluten-free selections include fresh mussels in a white wine, garlic and tomato broth; pasta stuffed with chicken and kale and tossed with cherry tomatoes and Gorgonzola; or the 16-ounce bone-in rib-eye smothered in amogio sauce and served with fresh tomato, red onion and blue cheese salad. Trevi, Caesars Palace, Forum Shops at Caesars, 3500 Las Vegas Blvd. S., Las Vegas, NV 89109, 702-735-4663. Offered through the month of April, The Golden Nugget’s new Sip and Stroll promotion allows guests to enjoy eight signature cocktails at eight of the resort's bars and restaurants for $40 per person. Participating venues include Bar 46, Cadillac Mexican Kitchen & Tequila Bar, Chart House, The Grotto, Ice Bar, Red Sushi, Rush Lounge and Vic & Anthony's. Participants receive one drink per location. Golden Nugget Hotel & Casino, 129 E. Fremont St., Las Vegas, NV 89101, 702-385-7111, 800-846-5336.